This movie is a musical. It has musical numbers. But it is the best kind of musical: the musical numbers are worked organically into the plot. When people in this movie sing, its when people would actually sing. They don't just spontaneously break out into song-and-dance numbers that nobody in the real world would ever witness, let alone participate in (in one of several hilarious scenes, a musical number intrudes on a conversation, and one of the characters remarks, "What the Hell is all that singing?"). All the numbers help reinforce a very specific, stylized world. 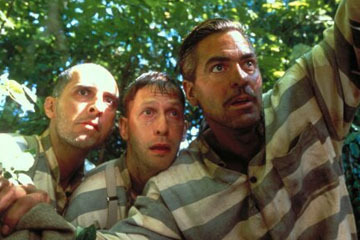 One of the reasons I like Coen brothers movies is that they create an entire, insulated world for each of them. It is hard to believe in this movie that there is any world outside of Mississippi. The cinematography bathes everything in a brilliant, sepia-photograph gold that helps pull everthing in even more towards itself. How could this depression-age Mississippi exist in the same universe as New York City, or Paris, or Hong Kong? It doesn't seem possible. All the characters are very stylized as well, but they are all skewed in the same direction so that they all fit together like pieces of a complete puzzle. George Cluny is magnificent as Ulysses Everett McGill, a man with a vocabary and way of speaking that seems highly out-of-place with the world through which he wanders. During the first climax, Cluny manages to put an expression of surprise and realization on his face for just a split second, but it is one of the funniest moments in the movie. John Turturro turns in another marvelous Coen brothers performace, but Tim Blake Nelson just about steals the movie from them as the abysmally dim-witted but endearingly innocent Delmar. Even the supporting characters, all fantastic character actors and many Coen regulars (John Goodman, Holly Hunter), blend seamlessly and just add to the world-view of this film. The Coens have obvious affection for these characters. But they are smart about it. Instead of doing some sort of schmaltzy affection, they are perceptive enough to realize that the audience loves these characters as-is, as not-so-bright adventurers forever bounding from one scrape to the next. This is my favorite kind of comedy. Never does it fall trap to rampant sentimentality over its characters or situations. Just like Raising Arizona (my favorite Coen movie, and my 2nd favorite movie of all time), when it looks like something is going to get schmaltzy or serious, the Coens yank the rug out from under it, hard, and you realize it was all just a swerve, a set-up for a punchline made all the more hilarious. In another joke, the Coens claim this movie is based on the Odyssey, much like they claimed that Fargo was a true story. But they don't just end there; there are enough sideways references to the Odyssey (sirens, a cyclops) to keep you trying to figure out all the corellations between it and the scenes of the movie, which I think is part of the joke. It all climaxes in a brilliant scene in which you think you know what is going to happen because that is what happens in the Odyssey. The screenplay is extraordinarily tight for a rambling, episodic adventure movie. I am hard pressed to think of much that is introduced and then left unexploited later in the movie. Maybe Pete's traitorous kinfolk? But even that is brought back in a way by exposing a part of Pete's character later on. Ah, the Coens: kings of reincorporation. Several times this movie makes you think there's nothing more to be done, and then something from early in the movie that you've forgotten comes roaring back and you roar with laughter at its unexpected return. This movie is filled with brilliant moments, some of which last a fraction of a second, and some of which go on for minutes and minutes. This is easily, easily one of the Best Movies of 2000.